Daily Illuminator: Get Ready For COMBAT!! April 4, 2015: Get Ready For COMBAT!! Combat is often one of the most fun (and detailed) aspects of many RPGs, and GURPS is no exception. Pyramid #3/77: Combat is devoted to the fine art of fighting. For starters, it features a detailed compilation and expansion of the GURPS scaling rules from Sean Punch. Attack giants, dodge drones, or battle against alien face-eaters with more ease and clarity than ever before. This issue also offers one of our most ambitious articles ever: a look at codifying monstrous threats in GURPS Dungeon Fantasy. With a few straightforward calculations, you'll be able to tell if a critter will be a pushover or wipe out the whole party. It also includes calculations for all Dungeon Fantasy monsters up through last month's Pyramid! But that's not all! Pyramid #3/77 also includes optional rules for aiming -- guns, bows, or lasers -- from Douglas H. Cole (of GURPS Martial Arts: Technical Grappling fame), new armor sets for GURPS Low-Tech: Instant Armor, historical armies for GURPS Mass Combat, and more. Don't fight the urge to add Pyramid #3/77: Combat to your library! 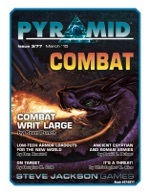 Pick it up individually, or subscribe to Pyramid today and get the latest and greatest for GURPS for months to come!